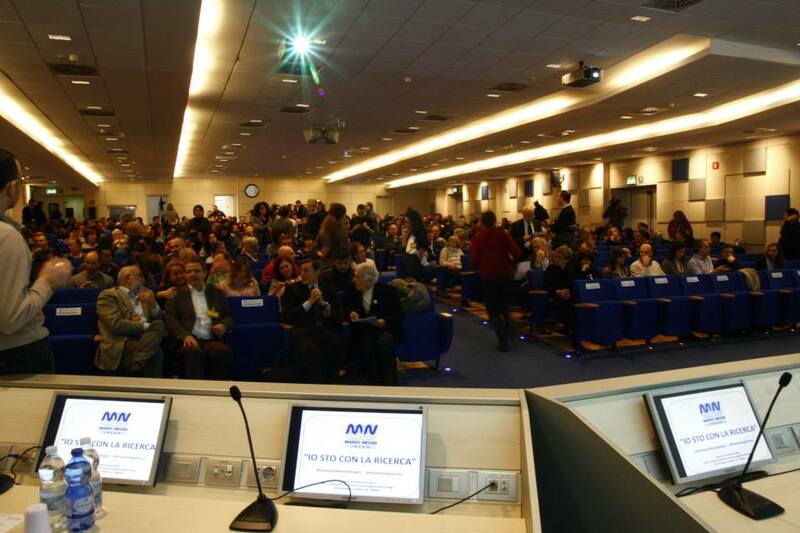 Italian science rallies for animal research at the Mario Negri Institute. On Saturday 30th November around 400 researchers, scientists and students met at the Mario Negri Research Institute in Milan, Italy, to take part in the “Io Sto Con La Ricerca” (I’m With Research) Convention, organized by Silvio Garattini, Director of the Institute. This Convention aimed to emphasize the importance of biomedical research to human health and the role of animal research within it. The event was organized in response to a concurrent animal rights march in the center of the city, which activists from the Animal Amnesty group had planned to end next to the Mario Negri Institute. The protesters were not only rallying against animal experimentation, but specifically against the Institute’s Director Garattini, who they condemn as a cruel “vivisector”. Just days before the rally, Garattini has received anonymous death threats from activists, which resulted in the authorities banning the animal rights march from ending at the Mario Negri Institute, and prompted the Mayor of Milan to issue a public statement to condemn the intimidation and offer support to the scientists who were meeting at the Mario Negri Institute. Many important Italian scientists and politicians participated in the conference, making speeches about the importance of animal research for science and human health and also offering solidarity with Silvio Garattini. Speakers included Gianluca Vago, Rector of the University of Milan; Francesco Brancati, President of UNAMSI, an association for medical and health information; Emilia de Biasi, President of the Senate Health Commission; Cristina Tajani, Research Authority of the City of Milan. It was also fantastic to see Paola Zaratin, the Director of Scientific Research for the Italian Multiple Sclerosis Society (AISM), one of the largest medical research charities in Italy. 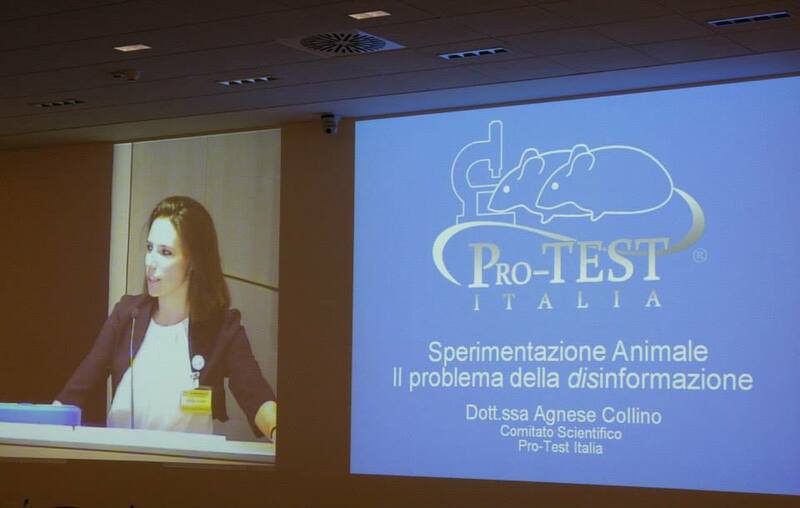 Other participants included the directors of every Research Institute of Milan, and Agnese Collino, a new member of Pro-Test Italia’s scientific committee, whose speech covered the misinformation surrounding animal research – often incorrectly described as a useless, outdated and cruel research method by animal rights activists – and the way animal rights activists misrepresent and distort images and quotations to advance their cause. The Convention went without a hitch of any kind, in a very calm and positive atmosphere, with people listening carefully and with interest to the speeches. Many journalists attended the event and wrote articles comparing it with the animal rights rally. Most described both views without taking a side, a slight but important change in the way they used to report news about this topic. Some did even better, for example the national newspaper La Republica published a series of images from the convention and the Milan daily newspaper Il Giornale published a great article entitled “The researchers rebel: We don’t torture animals”, while the popular and prestigious Milanese newspaper Corriere della Sera published an editorial in support of Silvio Garattini and the Mario Negri Institute. Director Silvio Garattini declared the event a great success, and thanked participants for helping to ensure that the public heard the viewpoint of researchers. We hope that this event, together with other events that Pro-Test Italia is involved in this week, could make people aware of what research actually is and how important it is for our lives, with the purpose of defeating ignorance and misinformation about this topic. Disinformation has caused increasing trouble for researchers, such as the adoption, by the Italian Parliament, of a new law, that places greater restrictions on Italian research that exists across the rest of Europe. Update: Yesterday the journal Science has reported that more than 13,000 people, the great majority Italian scientists, have signed a petition asking the EU commission to take action to save animal research – and indeed medical research in general – in Italy from damaging laws passed by the Italian parliament. It’s another sign of just how seriously the Italian scientific community is taking this threat to their countries scientific future. Posted on December 6, 2013 September 22, 2014 by EditorPosted in Campus Activism, News, Outreach NewsTagged animal research, EU directive, Italy, Mario Negri Institute, Pro-Test Italia, Silvio Garattini.